Oskyfizzante® Pink is a refreshing, sweet, fizzy wine with tropical fruit aromas including pineapple and lychee, followed by green apple and citrus on the palate. Pair Oskyfizzante Pink with a wide range of appetizers. Serve chilled. Chill, open, and celebrate! 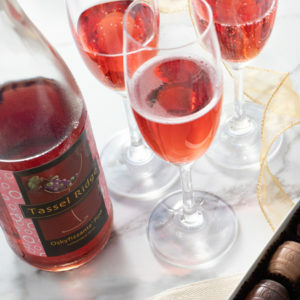 Tassel Ridge Oskyfizzante Pink is available at the Winery and at some of our 400 plus retailers in Iowa. If you don’t see Oskyfizzante Pink at your favorite store, ask the manager to get it for you.